At some point in the early 2000s, I was convinced that using makeup sponges (those little wedges) to apply my foundation was passé and the ONLY way to apply it properly was using a foundation brush. I admit using a brush was an improvement over those triangular wedges. My brush choices have really evolved over the years from the flat synt hetic brush you would paint on makeup in strokes, to a fluffier synthetic brush which buffs on foundation to an airbrushed finish! In the meantime, I have been using the Quo Blending Sponge. I am convince on using this method of blending foundation, and the Quo Blending Sponge is only around $5! I use it by soaking it with water and wringing it out, and then repeating this a few times. I like to wring it out only about 95% of the way, leaving a little bit of water in it. Then, I dot my foundation on my face with a cotton swab and proceed to use the sponge to blend it in. Alternating between using tapping and rolling motions, I work that foundation all over my face until it is totally blended and looks flawless. I manipulate the sponge using different angles depending on where I am blending on my face. The effect is airbrushed and flawless looking. I used to think sponges were ineffective and only a foundation brush could do the trick, but the Quo Blending Sponge has made me rethink everything I know about sponges. It is easy to clean with a little soap and water, and lasts a long time. Eventually it will start to show wear and tear, but at this price it is not painful to replace. Tell me Foxes, how do you like to blend? Categories: product reviews, Tools | Tags: application, beauty, beauty tips, BeautyBlender, foundation, Quo | Permalink. It’s the season of giving! So Foxy Face Beauty is helping you count down the days until Christmas with some pretty awesome beauty tips from experts across Canada! Today’s tip comes from Marie Bertrand in Calgary, Alberta. Marie is a Microbiologist, skin scientist, and medical spa owner. If you are in Calgary check out her business SkinScience Clinic to learn how they can help your skin become it’s best! 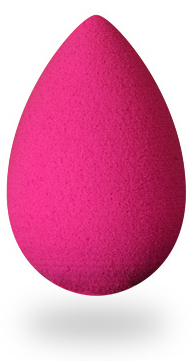 This BeautyBlender makeup sponge allows you to access those hard to reach places on your face, and creates a perfect makeup application. Sounds like a great stocking stuffer to me! So, have any of you Foxes tried this? I would love to hear about your experience with it – please comment below! Categories: advent calendar, beauty tips, complexion, make-up | Tags: advent calendar, airbrush effect, beauty, beauty tips, BeautyBlender, blending, foundation, SkinScience Clinic | Permalink. Hey Torontonians! Get #getboldinthecold at Dundas Square today and tomorrow. Enjoy complimentary mini makeovers, gift with purchase, and have a hot chocolate and a seat in the warming lounge. Valentines inspired makeup on a winters day!